Buried Treasure Fossils offers a fantastic collection of Cretaceous and Jurassic dinosaur fossils for sale from the US and Morocco. Fossil remains include well preserved teeth, bones, and claws, and are highly valued by collectors. These top quality specimens were all legally collected from private lands in the northwestern US and Morocco. All are authentic dinosaur fossils and legally collected from private land! US Dinosaurs - items are being added to the catalogs starting with Tyrannosaurus rex (T-Rex) teeth and Nanotyrannus teeth! All Moroccan dinosaur teeth catalogs are updated including Carcharodontosaurus (African T rex) teeth, Spinosaurus teeth, Raptor teeth, and Pterosaur teeth. Authenticity guaranteed. Have a look. If you're shopping around for dinosaur fossils for sale, you've come to the right place. Welcome to the online home of Buried Treasure Fossils. Here you can browse and buy an exceptional selection of bony antiquities. It depends on who you ask. A collector may tell you that dinosaur fossils for sale are amazing artifacts from a prehistoric world. Paleontologists at Idaho State University explain more scientifically. There are two kinds of fossils as well as two ways that fossils are made. Body fossils are the mineralized remains of plants or animals that lived and died in the geologic past. Trace fossils such as dinosaur tracks are stony indicators that long-ago life was present at a particular place and time. Bodies and traces may be preserved with or without alteration. Non-alteration modes of preservation include mummification and freezing. 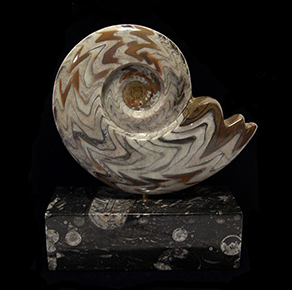 Shells remains are also considered unaltered fossils. According to ISU, preservation modes that do alter remains include permineralization and carbonization. Fossils are clues that paleontologists use to learn about animals that have gone extinct. Fossil remains such as dinosaur bones, teeth, and tracks offer fantastic evidence of life on earth long before there were humans to write history. Everything that scientists know about dinosaurs comes from fossil records, explains the American Museum of Natural History. Buried Treasure Fossils is pleased to present a marvelous collection of dinosaur fossils for sale from the Jurassic and Cretaceous periods. All our authentic dino fossils are legally obtained on private land in the United States and Morocco. High-quality specimens for sale include nicely preserved bones, teeth, and claws from ancient animals that roamed the earth for many millions of years. We don't have dragon bones for sale today, but we know you'll want to see our super selection of dinosaur fossils for sale. We're always expanding our collection, so bookmark our page and be sure to check back often. A GEM, EXTRA LARGE Spinosaurus aegyptiacus hand (manus) claw from the Kem-Kem region of Morocco. An exceptional manus claw. Incredible extra sharp tip. No break. No cracks. All original. Excellent rich tan & red colors. Exceptional surface - no pitting, nicks or wear! The tip has no wear or break which is very rare for a big Spinosaur manus claw. An exceptional quality, collector's claw. The finest quality manus claws that I have seen. Check out our selection of top quality Spinosaurus claws! Authenticity guaranteed. Museum Quality. Best of the BEST. Note - a Riker frame will be included. A rare, Top Quality, EXTRA LARGE Anzu wyleii hand (manus) claw from the Hell Creek Fm. of SE Montana. Another June 2018 Fossil of the Month. Anzu is referred to as the "Chicken from Hell". An exceptional manus claw. Highest quality rich brown color and patina. This specimen has incredible perservation with exceptional surfaces - no pitting, nicks or wear - superb surface articulation! There is some professional restoration which is typical for a big Anzu wyleii manus claw. The tip has a small section repaired and the proximal edge has a small triangular area repaired which starts at the center of proximal surface (see photo). A high quality, collector's claw from one of my favorite collecting sites. Note - 2014 Anzu wyleii description paper attached below. Check out our selection of top quality Anzu wyleii claws! Legally collected on private land in the Hell Creek Fm., Powder River Co., Montana. Authenticity guaranteed. Museum Quality. One of my favorites! Note - a Riker frame will be included. Note - Adding four Anzu wyleii claws in June 2018. Link to Anzu wyleii claws. A TOP QUALITY, LARGE Spinosaurus aegyptiacus hand (manus) claw from the Kem-Kem region of Morocco. An exceptional manus claw. No break. No cracks. All original. Excellent rich tan & red colors. Exceptional surface - no pitting, nicks or wear! Note - the claw has a mild bend which is a little distortion from burial in the surrounding sediment. Definitely no restoration. All natural. An exceptional quality, collector's claw. One of the finest quality manus claws that I have seen. Check out our selection of top quality Spinosaurus claws! Authenticity guaranteed. Note - a Riker frame will be included. A rare, Top Quality, EXTRA LARGE Anzu wyleii toe (pes) claw from the Hell Creek Fm. of SE Montana. Anzu is referred to as the "Chicken from Hell". An excellent pes claw specimen. Excellent rich brown color and patina. This specimen has very good perservation - no pitting, nicks. There is some professional restoration which is typical for a big Anzu wyleii pes claw. The very top of the proximal edge has some repair and one cracked was filled (see photo). A high quality, collector's claw from the Hell Creek of Montana. Note - 2014 Anzu wyleii description paper attached below. Check out our selection of top quality Anzu wyleii claws! Legally collected on private land in the Hell Creek Fm., Garfield Co., Montana. Authenticity guaranteed. Museum Quality. Note - a Riker frame will be included. A GEM, EXTRA LARGE Carcharodontosaurus saharicus tooth from the Kem-Kem deposits of Morroco. A fantastic deep red colored tooth - the most sought after color. Another October Fossil of the Month. Highest quality enamel with no enamel peel. Exceptional preservation. Excellent anterior and posterior serrations. Serrated to the tip. Excellent growth waves near cutting edge. No tip wear which is not common for these big teeth. An extra wide position tooth. One of my favorite tooth positions. No cracks. No Repair. No Restoration. A Top Quality BIG collector's tooth. Authenticity Guaranteed. 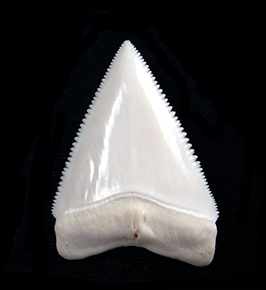 An exceptional BIG Carch tooth with excellent eye appeal! Note - Added 15 new Carchardontosaurus teeth in October 2018. Link to Carcharodontosaurus teeth. A TOP QUALITY, HUGE Carcharodontosaurus tooth from the Kem-Kem deposits of Morroco. An excellent brown colored enamel. Highest quality enamel. Exceptional preservation. Very good anterior and posterior serrations. Excellent growth waves near cutting edge. A small amount of tip wear which is common for these big teeth. An extra wide and extra thick tooth. One of my favorite tooth positions. Two small cracks (stabilized), but no breaks. No Repair. No Restoration. A Top Quality BIG collector's tooth. Authenticity Guaranteed. You do not find top quality teeth exceeding 4" very often! A rare, Top Quality Anzu wyleii hand (manus) claw from the Hell Creek Fm. of SE Montana. Anzu is referred to as the "Chicken from Hell". An excellent manus claw with no repair. Excellent rich brown color and patina. This specimen has very good perservation - no pitting, nicks or wear. There are two cracks filled which is typical for a Anzu wyleii claw, and there is a small sliver of the proximal end missing due to natural decay. A high quality, collector's claw from the Hell Creek of Montana. Note - 2014 Anzu wyleii description paper attached below. Check out our selection of top quality Anzu wyleii claws! Legally collected on private land in the Hell Creek Fm., Garfield Co., Montana. Authenticity guaranteed. Museum Quality. Note - a Riker frame will be included. A HIGH QUALITY ~6" Carcharodontosaurus tooth Large Carcharodontosaurus tooth from the Kem-Kem deposits of Morocco. Our November Fossil of the Month. This tooth is huge! An excellent brown color. High quality enamel with some enamel missing. Excellent overall quality and preservation. Exceptional anterior and good posterior serrations. Excellent growth waves near cutting edge. Large position tooth in jaw - extra wide crown. You can see a faint crack parallel to the anterior serrations on one side only, but no breaks. Absolutely no cracks running across the tooth. It has not been filled or painted. No repair or restoration. This is an all natural tooth which is quite rare for a XXL Carch tooth. A Museum Quality EXTRA LARGE tooth. This is my last top quality 5"+ Charcharodontosaur tooth and the second largest Carch tooth that I have seen. (The largest tooth was 6" and it was selling for $7k!). Serrated edge measures 4-1/2"+. Authenticity guaranteed! This monster Carcharodontosaurus tooth won't last long! M1201 SIZE: 5-3/4" (1-15/16" W) - straightline measurement! A GEM Tyrannosaur tooth from the late Cretaceous on northern North America. A July 2018 Fossil of the Month. This tooth could Albertosaurus, Gorgosaurus or Daspletosaurus - see Detailed Discussion below. This tooth measures 2" - a large sized Tyrannosaur tooth. The enamel is very high quality with excellent color / patina. Anterior serrations and posterior serrations are excellent. Serrated to the tip. No cracks or restoration. Legally collected on private land in the Two Medicine Fm., Chouteau Co., Montana. Authenticity guaranteed. Probably an excellent Gorgosaurus tooth based on size and locality found. Museum quality tooth. Best of the BEST! Note - Adding 16 new Tyrannosaur teeth in July 2018. Link to Tyrannosaur teeth catalog. A GEM Tyrannosaur tooth from the late Cretaceous on northern North America. A July 2018 Fossil of the Month. This tooth could Albertosaurus, Gorgosaurus or Daspletosaurus - see Detailed Discussion below. This tooth measures 2" - a large sized Tyrannosaur tooth. A big "beefy" tooth (1"W). The enamel is excellent quality with excellent color / patina. Anterior serrations and posterior serrations are excellent. Serrated to the tip. No cracks and restoration. Legally collected on private land in the Judith River Fm., Hill Co., Montana. Authenticity guaranteed. Probably an excellent Daspletosaurus tooth based on size and roundness of the tooth cross-section. Museum quality. Best of the BEST! A TOP QUALITY, Juvenile Spinosaurus aegyptiacus hand (manus) and foot (pes) claw from the Kem-Kem region of Morocco. An excellent manus and pes claw. The manus claw has one crack near tip - no fill. All original. Excellent rich tan. Exceptional surface - no pitting, nicks or wear! An excellent quality, collector's claw set from a juvenile Spinosaurus. Check out our selection of top quality Spinosaurus claws! Authenticity guaranteed. Note - a Riker frame will be included. A Top Quality, EXTRA LARGE Carcharodontosaurus saharicus tooth from the Kem-Kem deposits of Morroco. A fantastic red, brown & orange colored tooth. Highest quality enamel with essentially no enamel peel. Exceptional preservation. Excellent anterior and posterior serrations. Serrated to the tip. Excellent growth waves near cutting edge. Very small tip wear which is not common for these big teeth. One small wear facet from rubbing teeth. An extra wide and extra thick position tooth. No cracks. No Repair. No Restoration. A Top Quality BIG collector's tooth. Authenticity Guaranteed. An incredible BIG Carch tooth with excellent eye appeal! A Top Quality Tyrannosaur tooth from the late Cretaceous on northern North America. This tooth could Albertosaurus, Gorgosaurus or Daspletosaurus - see Detailed Discussion below. This tooth measures 2-1/8" - a large sized Tyrannosaur tooth. The enamel is excellent quality with excellent color / patina. Anterior serrations and posterior serrations are very good. Serrated to the tip. One crack stabilized and no restoration. Legally collected on private land in the Judith River Fm., Mussellshell Co., Montana. Authenticity guaranteed. Probably an excellent Daspletosaurus tooth based on size and roundness of the tooth cross-section. Museum quality. A Top Quality, Rare Pachychephalosaurus wyomingensis node cluster from the late Cretaceous of northern North America. Another March 2019 Fossil for the Month Offering. Pachychephalosaurus is the dinosaur which is famous for its large domed head surrounded by these spikes and nodes. This spike has excellent color / patina with exceptional surface articulation. It is a complete specimen with no cracks or breaks. This is a node cluster with a large node surrounded by a group of small nodes. Note - the excellent articulated skull surface on the base of the node. Legally collected on private land in the Hell Creek Fm., Powder River Co., Montana. An excellent and very rare collector's quality Pachychephalosaurus node cluster. You don't see these skull pieces very often. No repair or restoration. Authenticity guaranteed. A very special piece! A Top Quality Tyrannosaur tooth from the late Cretaceous on northern North America. This tooth could Albertosaurus, Gorgosaurus or Daspletosaurus - see Detailed Discussion below. This tooth measures 1-15/16" - a large sized Tyrannosaur tooth. A big "beefy" tooth. The enamel is excellent quality with good color / patina. Anterior serrations and posterior serrations are very good. Serrated to the tip. No cracks or restoration. Legally collected on private land in the Judith River Fm., Hill Co., Montana. Authenticity guaranteed. Probably an excellent Daspletosaurus tooth based on size and roundness of the tooth cross-section. Museum Quality tooth. A Top Quality, Rare Pachychephalosaurus wyomingensis node from the late Cretaceous of northern North America. Another March 2019 Fossil for the Month Offering. Pachychephalosaurus is the dinosaur which is famous for its large domed head surrounded by these spikes and nodes. This spike has excellent color / patina with exceptional surface articulation. It is a complete specimen with no cracks. Note - the excellent articulated skull surface on the base of the node. Legally collected on private land in the Hell Creek Fm., Powder River Co., Montana. An excellent and rare collector's quality Pachychephalosaurus node. You don't see these skull pieces very often. No repair or restoration. Authenticity guaranteed. A special piece! A Top Quality Tyrannosaur tooth from the late Cretaceous on northern North America. This tooth could Albertosaurus, Gorgosaurus or Daspletosaurus - see Detailed Discussion below. 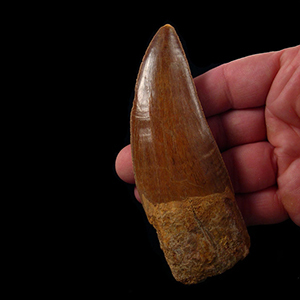 This tooth measures 1-13/16" - a large sized Tyrannosaur tooth. The enamel is excellent quality with fantastic color / patina. Anterior serrations and posterior serrations are very good. No cracks or restoration. Legally collected on private land in the Judith River Fm., Musselshell Co., Montana. Authenticity guaranteed. Probably an excellent Daspletosaurus tooth based on size and roundness of the tooth cross-section. A GEM Tyrannosaur tooth from the late Cretaceous on northern North America. This tooth could Albertosaurus, Gorgosaurus or Daspletosaurus - see Detailed Discussion below. This tooth measures 1-9/16" - a good sized Tyrannosaur tooth. The enamel is very high quality with fantasic color - the Leopard tooth! Anterior serrations and posterior serrations are excellent. Serrated to the tip. No cracks or restoration. Legally collected on private land in the Judith Fm., Hill Co., Montana. Authenticity guaranteed. Probably a Gorgosaurus tooth based on size. Museum quality tooth. A TOP QUALITY Carcharodontosaurus tooth from the Kem-Kem deposits of Morocco. Gorgeous deep RED and Golden tan colors! The colors provide a "Tiger Eye" appearance. Highest quality enamel with an incredible red patina. Exceptional preservation. Very good anterior and posterior serrations. Excellent growth waves near cutting edge. One crack. No Restoration. A Museum Quality LARGE tooth. Authenticity guaranteed. A TOP QUALITY Carcharodontosaurus tooth from the Kem-Kem deposits of Morroco. Gorgeous deep RED color! Highest quality enamel with an incredible red patina. Exceptional preservation. Very good anterior and posterior serrations. Excellent growth waves near cutting edge. No cracks! No Restoration. A Museum Quality LARGE collector's tooth. Authenticity Guaranteed. A Top Quality, Rare Pachychephalosaurus wyomingensis node cluster from the late Cretaceous of northern North America. Pachychephalosaurus is the dinosaur which is famous for its large domed head surrounded by these spikes and nodes. This spike has excellent color / patina. It is a complete specimen with no cracks or breaks. Note - the excellent articulated skull surface on the base of the node. Legally collected on private land in the Hell Creek Fm., Powder River Co., Montana. An excellent collector's quality Pachychephalosaurus node. You don't see these skull pieces very often. No repair or restoration. Authenticity guaranteed. DP35 SIZE: 2-1/8" H ; Base 1-1/2" x 1-1/2"
A Top Quality, Rare Pachychephalosaurus wyomingensis spike from the late Cretaceous of northern North America. Pachychephalosaurus is the dinosaur which is famous for its large domed head surrounded by these spikes and nodes. This spike has excellent color / patina. It is a complete specimen with no cracks or breaks. Legally collected on private land in the Hell Creek Fm., Powder River Co., Montana. An excellent collector's quality Pachychephalosaurus spike. You don't see these skull pieces very often. No repair or restoration. Authenticity guaranteed. A rare, TOP QUALITY Carcharodontosaurus saharicus tooth from the Kem-Kem deposits of Morroco. Premax tooth. Gorgeous deep RED color! Highest quality enamel with an incredible red patina. Exceptional quality and preservation. Excellent anterior and posterior serrations. Excellent growth waves near cutting edge. No cracks. No restoration. A Museum Quality LARGE tooth. Authenticity guaranteed. An incredible, very rare Carcharodontosaurus Pes (toe) claw from the Kem-Kem deposits of Morocco. A massive pes claw - bigger than most. Please note that there are minimal breaks and no restoration. Natural color and surfaces. It is difficult to find a better example without heavy restoration. Proximal end is well preserved. This claw is 1-5/8" wide and 1-1/4" thick. This claw is big & fat, and much better quality than most. No restoration. Remember if it looks too good, it is probably a fake! A very rare dinosaur claw! A fantastic opportunity to own a very rare, large Cretaceous theropod claw for less than $1000. The real deal! Authenticity guaranteed. A HUGE, TOP QUALITY Spinosaurus aegyptiacus tooth from the Kem-Kem region of Morocco. An October Fossil of the Month. High quality enamel with well preserved and pronounced grooves running up the crown. Little crown tip wear for a big tooth. A fantastic deep red patina - rare color for a Spino tooth, and the surface has a drusy crystalline appearance - very nice and very rare. Plus this is an extra thick BIG Spino tooth that would have been easily 1-1/2" thick at the base - see photo. One of the fattest Spino teeth that I have seen. No cracks. No repair and restoration. A very special, big collector's tooth from an extra large Spinosaurus - the 50 foot variety! Plus rare deep red color with a crystalline surface. An essentially PERFECT tooth. You do not see the top quality BIG Spino teeth very often. Authenticity guaranteed. Best of the BEST! Note - 15 new Spinosaurus teeth added in October 2018. Link to Spinosaurus teeth. A GEM Tyrannosaur tooth from the late Cretaceous on northern North America. This tooth could Albertosaurus, Gorgosaurus or Daspletosaurus - see Detailed Discussion below. This tooth measures 1-1/4" - a young Tyrannosaur tooth. The enamel is very high quality with excellent color. Anterior serrations and posterior serrations are excellent. Serrated to the tip. No cracks or restoration. Legally collected on private land in the Two Medicine Fm., Glacier Co., Montana. Authenticity guaranteed. Probably a joung Gorgosaurus tooth based on size and locality. Museum quality tooth. A GEM Tyrannosaur tooth from the late Cretaceous on northern North America. A July 2018 Fossil of the Month. This tooth could Albertosaurus, Gorgosaurus or Daspletosaurus - see Detailed Discussion below. This tooth measures 1-11/16" - a good size Tyrannosaur tooth. The enamel is very high quality with excellent color. Anterior serrations and posterior serrations are excellent. Searrated to the tip. No cracks or restoration. Legally collected on private land in the Judith River Fm., Hill Co., Montana. Authenticity guaranteed. Probably an extra large Albertosaurus tooth based on size. Museum Quality tooth. Best of the BEST! An incredible, very rare Carcharodontosaurus Pes (toe) claw from the Kem-Kem deposits in Morocco. Please note that there are minimal breaks and no restoration. Natural color and surfaces. It is difficult to find a better example without heavy restoration. Proximal end is nicely preserved. A great opportunity to own a rare, large Cretaceous theropod claw for less than $1000. You don't see these very often. The real deal! Authenticity guaranteed. A Top Quality, Rare Pachychephalosaurus wyomingensis node from the late Cretaceous of northern North America. Pachychephalosaurus is the dinosaur which is famous for its large domed head surrounded by these spikes and nodes. This spike has excellent color / patina. It is a complete specimen with no cracks. Note - the articulated skull surface on the base of the node. Legally collected on private land in the Hell Creek Fm., Powder River Co., Montana. An excellent collector's quality Pachychephalosaurus node. You don't see these skull pieces very often. No repair or restoration. Authenticity guaranteed. A Top Quality, EXTRA LARGE Carcharodontosaurus saharicus tooth from the Kem-Kem deposits of Morroco. A fantastic brown colored tooth. Highest quality enamel with one patch of enamel peel. Exceptional preservation. Excellent anterior and posterior serrations. Serrated to the tip. Excellent growth waves near cutting edge. Small tip wear which is common for these big teeth. One crack. No Repair. No Restoration. A Top Quality BIG collector's tooth. Authenticity Guaranteed. 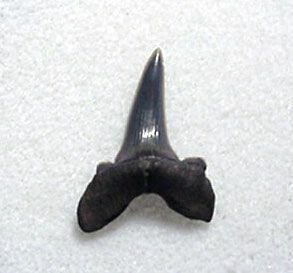 An excellent BIG Carch tooth with good eye appeal! A TOP QUALITY Carcharodontosaurus tooth from the Kem-Kem deposits of Morocco. Gorgeous deep RED and GOLDEN tan colors! Highest quality enamel with an incredible red patina. Exceptional preservation. Exceptional anterior and posterior serrations - serrated to the tip. Excellent growth waves near cutting edge. No cracks! No Repair. No Restoration. A Museum Quality large tooth. Authenticity guaranteed. A Top Quality Pachychephalosaurus wyomingensis pes ungual (foot claw) from the late Cretaceous of northern North America. 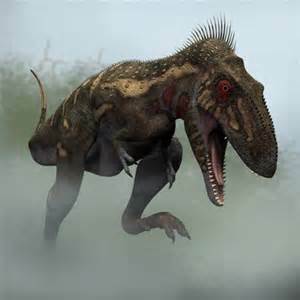 Pachychephalosaurus is the dinosaur which is famous for its large domed head surrounded by spikes. This ungual has excellent color / patina. There is one barely visible stress fracture which is stabilzed. Small portion of the end of each "wing" (rear of the base of the blood groove) has some damage. Overall an excellect pes ungual. Note - this ungual has the Pachy twist (see Pachy ungual differentiation discussion below). No repair restoration. An ultra rare Pachy pes ungual! Legally collected on private land in the Hell Creek Fm., Powder River Co., Montana. An excellent collector's quality Pachychephalosaurus ungual. My largest Pachy claw. Note - claw comes with a Riker type frame. Authenticity guaranteed. Authenticity guaranteed. An EXTRA LARGE, TOP QUALITY Nanotyrannus lancensis tooth. This tooth measures 1-13/16". You do not see Nano teeth exceeding 1-1/2" very often. The enamel is exceptional with fantastic color and quality. Excellent serrations with some missing. Minor tip wear. One crack that has been stabilzed. No repair. Legally collected on private land in the Hell Creek Fm., Powder River Co., Montana. Authenticity guaranteed. A fantastic extra large collector's Nano tooth. Museum quality. Note - a Riker frame is included. A Top Quality Thescelosaurus neglectus pes ungual (foot claw) from the late Cretaceous of northern North America. Thescelosaurus is a mid-sized dinosaur found in the Hell Creek formation. This claw is excellent quality with excellent color / patina. Note - Thesc unguals are described as flat triangles. (see Thesc-Pachy claw differentiation discussion below). Most likely one stress crack - stabilized cracks and no restoration. A rare Thescelosaurus pes ungual! Legally collected on private land in the Hell Creek Fm., Powder River Co., Montana. Excellent collector's quality Thescelosaurus claw. Note - claw comes with a Riker type frame. Authenticity guaranteed.